These five holiday mantras will help ensure a slow and simply holiday season with your family this year. I’ve recently discovered I’m happy choosing a, well, more relaxed Christmas. Sure I want a tree, and a few homemade baked goodies, and presents for the kids to unwrap. But mostly, I just want time and space to connect with my family on these days off. This Christmas I don’t want to spend hours in the kitchen while my kids play with their toys. I want to watch them play. Heck, to be honest, I want to get on the floor with them and play too. In previous years, I’ve felt the strong pull of expectations to have the best-dressed house and the most carefully thought out presents (a careful mix of homemade and purchased items). Food, glorious food! Christmas baking all December, hours in the kitchen rolling dough, icing biscuits, pouring over recipe books and Pinterest to find the perfect dishes for the day. I want a simpler Christmas. 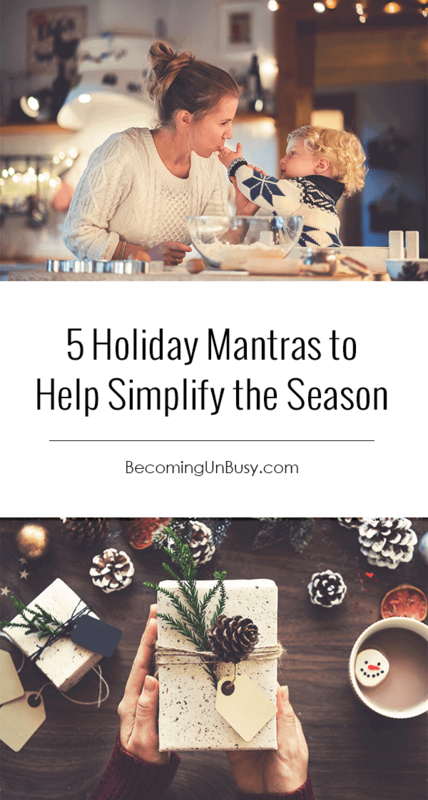 Here are five holiday mantras you can quietly repeat to yourself to get closer to simple this Christmas season. 1 | Good enough is good enough. Yes, do a bit of Christmas baking, but you don’t have to bake for the whole street. And nope, it doesn’t need to be perfect. Kids icing gingerbread men will happen in our kitchen, and they will be given to guests! 2 | Presence over presents. Being present for people over things. You could spend hours and hours searching for, making and wrapping presents. Or you could take a simpler approach to giving to loved ones, and make Christmas shopping more of a nonevent (and less stressful). Experiences and plants are my go-to gift! Easy for me and usually more meaningful for the receiver. 3 | Slower and softer. You don’t need to rush everywhere. Yes, it’s a chaotic season, but if you pare back to the basics; there shouldn’t be any need for the phrases ‘hurry up’, or ‘I don’t have enough time.’ Give your kids a sense of slow, wandering, and adventure. They just won’t get that if we’re rushing them to the next thing all the time. Nurturing never happens in a rush. 4 | Simple is ok.
It’s tempting to go all out at this time of the year, literally decking the halls with holly. Who’s going to notice or care if you just have a tree? Or, if you just string up some festive lights? And with the baking, do we really need gingerbread men and three different kinds of iced cookies?! Does the table need to be set with the most on-trend decor? Pinterest is my worst enemy at this time of the year! We want our kids to grow up with wonderful memories from their childhood. Be intentional with this by creating a few simple holiday rituals. It’s super tempting to do everything at this time of the year. FOMO (Fear Of Missing Out) and social media are very good at keeping us busy. Here’s the thing — If we try and do all things, we only end up exhausted. Instead, choose a couple of things to become part of your family’s story. One of our simple family traditions is going out the week before to look at the Christmas lights in our little town. People spend lots of money making their houses a wonderland and the kids love it! Experiences are the things kids will remember, not what they got in their stocking. The holidays are about family. At the core, the Christmas story is about a baby being born into a family — for Humanity. So whatever you do this Christmas, know that simplicity will come when Christmas is celebrated in a way that allows us to be present for the ones we love most.